What was the reason for the wall? 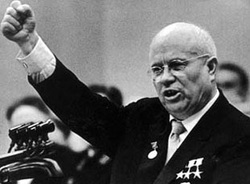 The idea for the wall came from Soviet premier, Nikita Khrushchev. He needed a way to stop the East Germans from fleeing to West Germany. Of course in the beginning, this was not a problem. Many East Germans left to go to West Germany due to Communist rule. West Germany was also more advanced than East Germany. This caused a problem in both the East and the West. In the East, many of the people who left were very skilled and needed in the East. In the West, the population soon became extremely large causing an economic stress. On August 13th 1961, the Russians placed a simple barbed wire fence up to block the entrance in to western Berlin. Many Germans protested but they were not acknowledged. 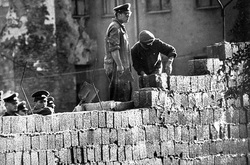 By August 16th, the wall was completed with concrete. 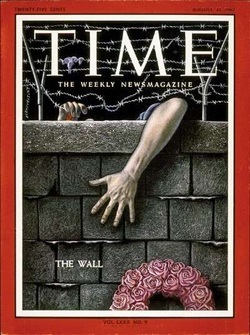 TIME magazine's interpretation of the grim life that lied behind the Berlin Wall. What did the wall do? 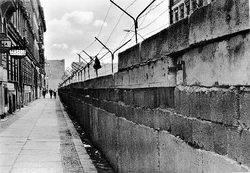 The Berlin Wall blocked East Germans from fleeing communist rule in Eastern Germany. Not only for the good of East Germany but for West Germany as well. The west didn't want any socialists entering their fascist country. The wall was built from barbed wire and concrete.